The most eye opening post for 2010 goes to Pam of Off the Cuff Style. Not just because of her amazing interfacing. But, because she saved me $100. Yes. That’s right. $100. My dry cleaner charges $10 a piece to steam press my wools. I like to have all my fabric pre-shrank / pre-treated so they are ready to go when I am. I read her post on treating at home. It doesn’t involve an iron. Yes. NO IRONING. No hours over an ironing board. I’ve tried both her steam dryer and hot towels in a regular dryer. The hot towels in my dryer were used for the fabric I took to NYC to be interfaced. Came out beautifully. 15 minutes in her dryer my wools were warm but dry. I let them hang over her balcony to cool. Mission accomplished. See, Pam totally saved my $100. I was absolutely ready to camp out on Black Friday to get the Sears fancy dryer for $500 less. But, then I remembered there was nothing actually wrong with my dryer. Bless you my child!! DH and I got a new washer/dryer over Labor Day weekend, and the dryer has a steam setting. I didn’t even realize it could be used to steam shrink wool! ROTFLOL! Your friends must think you are a nut! *LOL* But I’m glad that you’ve found a quicker and easier way to steam your woolens that don’t cost you a $100! When I sew wool sometime in the future – I’ll remember this tip: friends with dryers with steam setting. Good, better if they’ve got some booze in the refrigerator too. I have an LG washer and an LG dryer; they both have steam cycles. I have found that the steam cycle is a wonderful and very easy way to pretreat fabric and to gently refresh a jacket/pants/shirt before wearing. They save hand steamer/ironing time and dry cleaning costs. Since I feel like this is a public service announcement (smiles), they are energy efficient appliances that qualified for the 2009 tax rebate (I am not sure if that rebate remains in place for this calendar year), and my water usage/bill did really go down. I bought mine in an end of year (2009) sale; my old washer dryer were more than 13 years old, and I knew it was only a matter of time! The steam cycle is just brilliant. Sigh, I hug the red LG steam washer/dryer set every time I am at Home Depot. I think my Maytag dryer is going to last forever just to spite me. Possibly the same set I’ve been drooling over :-). I’m ‘almost’ hoping the 10yr old Maytag set that has given me no trouble will croak. I HAVE used the hot towel method, though, and it works like a charm. It was a wonderful tip. I too tried this method on my Sears dryer (which my husband bought used from a couple in Balt about 20 years ago) and the fabric came out beautiful. 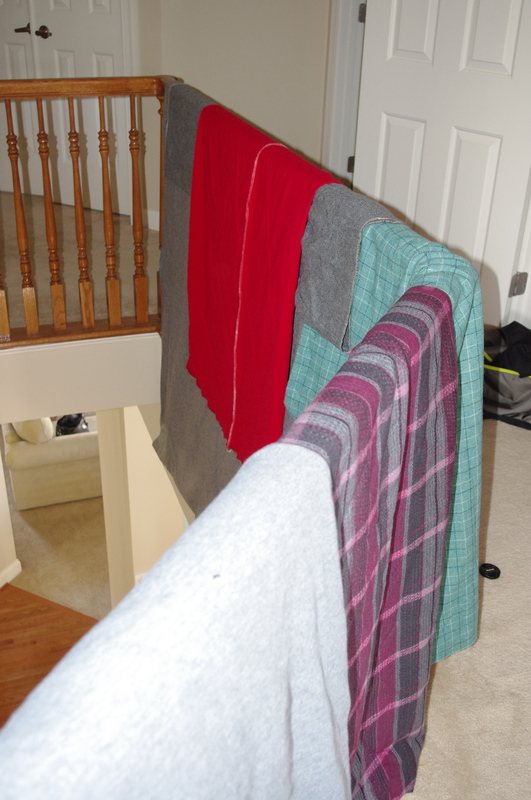 No steam on my dryer but the hot towels work perfect! I’m glad to see that I’m not the one who keeps fantasizing about her dryer dying! Mine a basic front loader so it doesn’t have a steam cycle. I’ll have to try the damp towel method until mine goes. My washer and dryer (a match set) are almost thirty years old! Yes, 30! Instead of buying a new ones when they have clucked out – I have had them repaired for less then $200 (a lot cheaper then replacing them). The last repair technician told me that no way could these be fixed again since they are just too old and replacement parts are no longer available!! Yeah! Maybe someday I will get a steam dryer but in the meantime my Whirlpools keep chugging along. Allow me to Justify for you. If you don’t go buy that dryer on sale, yours will die, out of spite. If you do buy that dryer, you can sell your old for, what? $100? So, there’s the hundred saved from the article, $500 from the sale, throw on another hundred from selling the old one – DEAL! I liked this post for many reasons, but I loved reading the comments. Wow. Great writing. Now I need to go read Pam’s pretreating post so I can save money and have fewer excuses for avoiding my wool stash…. 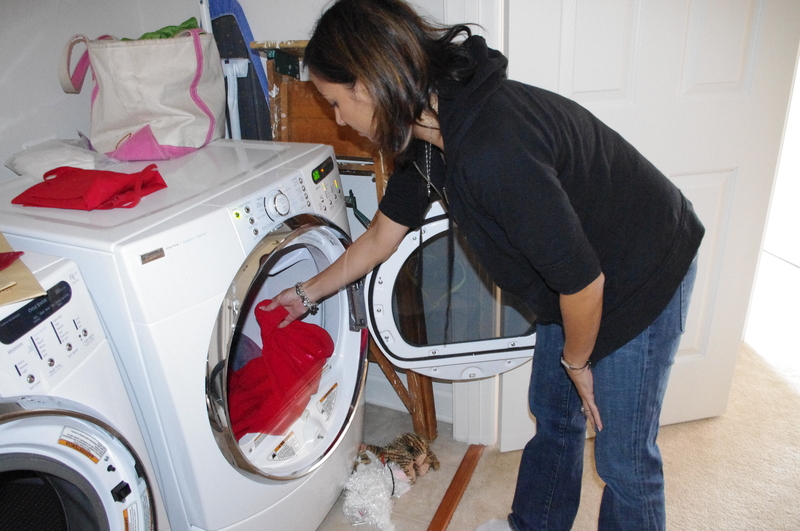 I bought the LG washer/dryer set a few years ago, with a steam washer but before the steam dryer was available. I LOVE the steam washer, for more reasons than just the ability to steam shrink. It uses less water, and does a better job of extraction (extraction the dirty water is how your clothes get really clean) than the Bosch it replaced. So I’m not dreaming of the steam dryer, but I do recommend home steaming as the way to go in preshrinking! There are dryers with steam settings? where have I been? Wow, and duh,lol. I also have the singing Lg set, but have never thought about using it to pre-shrink fabrics! I am truly having a duh moment. Thank you for the advice on pretreating the fabric. I’ve never heard of it before. I will definetly try this! miss celie, do you have one of those one-price cleaners near your house, just in case? where they charge you $2.49 or something like that no matter what you take in? Now I really wish my Maytag dryer would die! I already was hoping it would for the silly reason that it is beige and doesn’t match the Frigidaire washer and has dents because we bought it the scratch and dent section 13 years ago. But alas, it works and dries clothes. Darn. 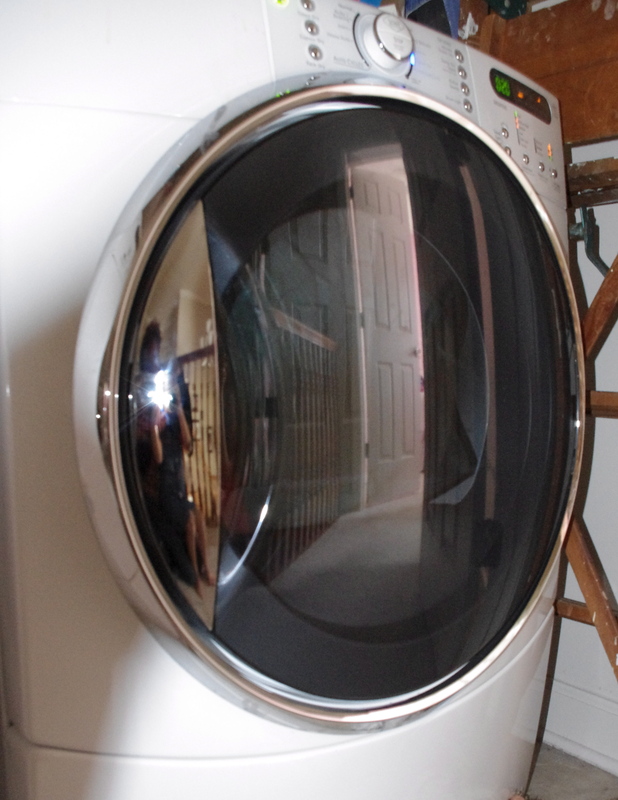 I sold my top-loading washer and companion dryer several years ago when the Kenmore Elite first came out. I love me a front loading washer. It is easier on clothes and does save a lot on water bills. New models are available. I say go for the more effecient washer, sell your older model. All you will have to do is pre-treat fabric 5 times and you have already made up the cost of the new washer. This is interesting to me for two reasons : first, a coworker bought a propane powered dryer because he lives in the hills and it’s very humid so his laundry takes too long to dry. Second, because I was recently offered some $15US/1m15 Casimir which turns out to be Keysermere (sp?) or what I guess is tropical wool suiting. I settled for the $10 yucky polyester suiting because I needed a wash and wear pencil skirt but I’m very tempted. But I guess I would have to pretreat the traditional way, with an iron. Oh, joy! PS Would you mind letting me know about the patterns we talked about the other day? Emailed you but not sure if you got it. TIA!